North- east Tuscany: a wild landscape where the Apuan Alps meet the Mediterranean sea. This place deserves to be discovered. Tuscany Holiday Rent proposes interesting holiday accommodations in the area, nice apartments for rent in a villa on the Versilia coast, not far from Carrara quarries. From the beach you can have a sight of them. Here, they, like white scars on the mountains, proudly stand, ready to tell their stories of great artists and humble quarrymen both struggling, though from different perspectives, against the secrets of this wonderful stone. The focus of marble related activities is Carrara, a small town, already known by the ancient Romans who first exploited the quarries to state their challenge against time and to asseverate their power. After the oblivion of the Middle Ages, marble in the Renaissance was back in use, widely employed in Florence, Rome and Venice. Michelangelo, the artist of the “Pietà”, used to come here to personally choose the” Statuario” (the white marble for sculptures). The foundation of the Academy of Fine Arts, dating back to1769, stated the vocation of the land, thanks to Maria Teresa Cybo- Malaspina from a Genoa family of rich merchants, well connected with the most prestigious European noble families. The famous institution was boosted by Napoleon who bestowed the Grand Duchy of Tuscany on his sister Elisa Baciocchi. It’s the season of Neoclassicism. 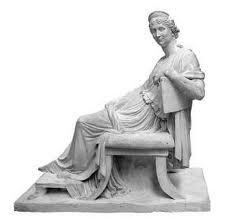 Famous sculptors such as the French Chinard, the Italian Canova or the Danish Thorvaldsen came to Carrara, either to choose the marble blocks or to directly work in the best local workshops. 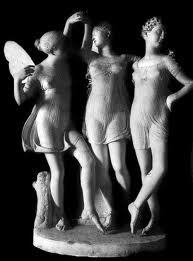 To Carrara artistic tradition the homage of the exhibition “ D’Apres Canova. L’800 a Carrara (After Canova, the 19th century in Carrara), inaugurated in June 2011, and lasting up to June 2012 . The event shows 26 plaster casts from the Academy collection. A charming tour into the manifold streams of the 19th century Carrara sculpture. The visitor is firstly welcomed by the 1810 sculpture of Napoleon’s mother, Letizia Ramolino Bonaparte by Canova, the reference artist for Carrara sculptors, together with Lorenzo Bartolini and Bertel Thorvaldsen. Pietro Tenerani is emblematic in this sense. 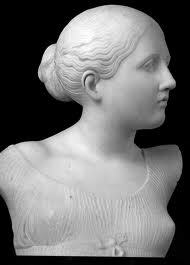 His “Paride” ,“Psyche Abandoned” and” Psyche Fainted”, are so close to the stylistic elements of Canova. Later he will lately abandon Canova’s path, to surrender to his statues’ inner lives. He, in fact, will pave the way to the peculiar style of what will be later defined as the “Scuola di Carrara” well represented by Bernardo Tacca and Luigi Bienaimè. Among the outstanding sculptors the exhibition highlights particularly Carlo Finelli who, though heir to Canova, succeeds in overcoming classicism in his masterpiece “Le Ore” because of the work’s psychological connotation and movement, beyond any abstraction and stiffness of the great neoclassical artist. Actually times are changing and something new is springing out. Hence the new social approach to art by Pietro Lazzerini and Carlo Nicoli . The echoes of a new perception of life are creeping inside the Academia where the first romantic and realistic hints are timidly trying to shadow neoclassical taste, still hard to die.